Washington, D.C.--(UP)--Tune in today on the voice of doom. It won't be the voice of doom, exactly, but the war department says it will be "the sound generated by uranium." The war department will broadcast sounds emitted by uranium on the NBC national hour, starting at 3 p.m. CST. It will, the department said, be the first time in history that uranium has made a coast-to-coast broadcast. A bit of uranium encased in a metal container will be held close to a Geiger-Mueller counter, a device used by scientists to gauge radioactivity. Uranium, being radioactive, emits infinitesimal bits of atomic matter called protons, electrons, photons, and alpha particles. As the counter counts them, the sound produced will go on the air. It is not expected to be anything like the sound heard at Hiroshima and Nagasaki. Complete coverage of the Bikini bomb tests today will be offered by NBC over Station KGNC. Three NBC commentators, W.W. Chaplin, Ralph Howard Peterson and George Thomas Folster, are in the Marshall Islands for the event. Chaplin will participate in a four network pool representative aboard the USS Mount McKinley. Peterson will be stationed on the Mount McKinley during the test. In addition to the two pool broadcasts, NBC is preparing its own exclusive coverage. The National Hour will originate from the Marshalls at 2 o'clock with the on-the-spot commentary and interviews by the three NBC correspondents. Following the test, views of the scientists and military men who witnessed the explosion will be broadcast. "Bikini Bomb Takeoff" will be aired for five minutes somewhere between 1:30 and 2 o'clock this afternoon. It is a pool broadcast of hte description of the takeoff bombing plane. Chaplin and Bill Downs from an observation plane are expected to broadcast. "Operations Crossroads" will be heard from 4 until conclusion, approximately 4:45 o'clock. This is the actual dropping of the atom bomb. Larry Tighe aboard the Applachian will give a picture of what is to come, including view of targets. Bill Downs on observation plane, Don Bell with interviews with Navy officials. Clete Roberts interviewing scientists, Chaplin at the operations base and George Folster on McKinley will keep the listeners posted on events from each angle. At the zero hour the bombardier will talk his way over the target. Listeners will hear the intercom conversation metronome ticking over the target and then the blast. All programs will stand by to go on as usual if the bomb test is cancelled because of weather or such reason. 3:00--WMAQ--Army hour presents final broadcast. 3 p.m.--National Hours (WIBA): new program with Robert St. John and Robert McCormick, narrators. Guests, Clinton P. Anderson, secretary of agriculture; Andrew Cairnes, chief of food section of UNRRA, discussing "Problems of Peace." Annnouces 'The Housing Situation' as next. 3 p.m.--National Hours (WIBA): John Blanford, National housing director, "American Housing." Sunday NBC 4 National Hour, "Housing Problem." The NBC National "Hour" at 4 p. m. Sunday is to discuss the question of a Unified Command, and has scheduled Adm. William F. Halsey and Rear Adm. Forrest P. Sherman to outline the Navy's position and Lt. Gen. James Doolittle and Gen. Joseph W. Stilwell to speak on the Army's side. Preliminary to devoting its schedule next Saturday to all-day Victory Bond broadcasting with numerous special programs, NBC plans to point to the occasion throughout the week with pickups from various networks stations. 3 p.m.--National Hours (WIBA): Adm. William F. Halsey and Rear Adm. Forrest P. Herman, Lieut. Gen. James Doolittle and Gen. Joseph W. Stilwell, discuss army-Navy merger issue. The NBC national "hour" at 2 p. m. Sunday, to discuss the question of a unified command, and has scheduled Adm. William K Halsey and Rear Adm. Forrest Sherman to outline the navy's position. Gen Joseph W. Stillwell, will speak to the Army's side. 3 p.m.--National Hours (WIBA): Col. John C. Stillwell, Maj. Gen. Lesllie Groves, Maj. Gen. Thomas Farrell. WASHINGTON. WV- The nation's highest wartime safety award was made today for an undertaking which could have produced history's most disastrous accidentthe atom bomb project. The National Safety council's award for distinguished service to safety was presented to the Manhattan district in recognition of the corps of engineers achievement in maintaining "outstandingly low" accident rates in facilities throughout the country. Maj. Gen. Richard Leslie Groves, the army's top man on the project, gave credit to all the universities and industrial organization; which "cooperated so magnificently," in accepting the award on NBC's "National Hour" program. 4:00 WEAF: National Hour--guests: Bob Hope, Earl Wilson, Bill Stern. 4:00 WEAF: The National Hour--background on UNO, also a talk by Eleanor Roosevelt from London. 3 p.m.--National Hours (WMAQ): report on reconversion, with Robert St. John and Robert McCormick. 4:00 WEAF: The National Hour--"The Enigma of Surplus War Property." W. Stuart Symington, Surplus Property Administrator; Sen. Joseph O'Mahoney, others. 4:00 WEAF: The National Hour--methods used by swindlers to mulct the public. 3 p.m.--National Hour (WMAQ): "Is Inflation Here to Stay?" Robert St. John and Robert McCormick. What Now For the Marines? 3 p.m.--National Hour (WMAQ): observes first anniversary of invasion of Iwo Jima; guests, Gen. Alexander Vandegrift, commander in chief, U.S. marine corps; James F. Forrestal, secretary of navy. 4:30 WEAF: The National Hour--the story of postwar railroads. Warren Kendall, ODT; John Pelley, AA of R.
4:00 WEAF: The National Hour--deals with juvenile delinquency. Guest speaker: Judge Anna M. Kroes. 4:00 WEAF: The National Hour--"The Future of Small Business." Speaker: Alfred Schindler. 3 p.m.--Masters Golf Tournament (WMAQ). 4:00--National Hour, Description Masters Golf Tournament, WEAF. 4:00 WEAF: The National Hour--first report of one of the war's most important technical developments. 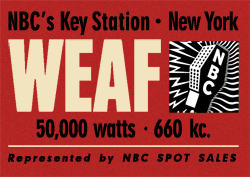 4:00 WEAF: The National Hour--a discussion of the problems of the U.S. Merchant Marine. 2 p.m.--National Hour (WMAQ): report on first six months of peace by MBC reporters; "The Calendar of Peace." George Thomas Folster, from Tokyo; Henry Cassidy, from Paris; Roy Porter, from Germany; W. W. Chaplin, from New York. 2 p.m.--National Hour (WMAQ): program dedicated to "I Am an American Day." 2 p.m.--National Hour (WIBA): dedicated to 50th anniversary of automobile industry. 2 p.m.--National Hour (WMAQ): "The Food Problem," Gove Hambridge, director of food and agriculture, United Nations; John MacVane, substituting for Robert St. John. 4:00 WEAF--National Hour: Major Gen. Philip B. Fleming, "Highway Safety." 2 p.m.--National Hour (WMAQ): presents special broadcast on safe driving; drama, "The Invisible Hitchhiker;" speaker, Maj. Gen. Philip B. Fleming, chairman of Truman's highway safety conference. 2 p.m.--National Hour (WMAQ): description and complete rehearsal at Bikini atoll for atomic bomb tests. All networks are completing arrangemnents for full coverage of the atom bomb test at Bikini this weekend and on next Sunday when the bomb will be dropped. Twenty-four hours before the scheduled dropping of the bomb NBC will broadcast a round table of the test in a pool broadcast from Adm Blandy's Joint Task Foice No 1 on Satmday at 5 30 p m. On Sunday during the National Hour W W Chaplin, George Folstcr and Ralph Howard Peterson NBC commentators will be on hand to report of the test. 2 p.m.--National Hour (WMAQ): reports of atom bomb test at Bikini by W.W. Chaplin, George Thomas Folster, and Ralph Howard Peterson from the test area. 2 p.m.--National Hour (WMAQ): Lyle Watts, chief of department of agriculture's forestry service, "Forestry and the Future;" dramatization of causes for present lumber crisis. 46-07-21 Wisconsin State Journal - 2 p.m.--National Hour (WMAQ): "A Star for Paradise--Statehood for Hawaii," Ingram M. Steinback, governor of Hawaii, from Honolulu; and Rep. Joseph R. Farrington, Hawaiian delegate to congress. 46-07-28 Wisconsin State Journal - 2 p.m.--National Hour (WMAQ): discussion of Paris Peace Conference by Henry Cassidy, Richard Harkness, Merrill Mueller, Dr. Max Jordan, Roy Porter, and Paul Archinard, all speaking from Paris. 46-08-04 Wisconsin State Journal - 2 p.m.--National Hour (WMAQ): "The Prisons We Deserve," James V. Bennett, director of Federal Bureau of Prisons; Warden James A. Johnsoton of Alcatraz. 2 p.m.--National Hour (WMAQ): "How America Spends Sunday Afternoon;" guests, Mr. And Mrs. Edgar Bergen and their baby; interviews with people at Coney Island; families in Chicago; visitors at San Francisco zoo; and Kathryn Skeffington's Singing Grandmothers, from Lincoln Park, Chicago. 46-08-18 Wisconsin State Journal - 2 p.m.--National Hour (WMAQ): "A Plane in Every Garage." 46-08-25 Wisconsin State Journal - 2:00 National Hour--WMAQ 46-08-25 Brooklyn Eagle - 4:00--National Hour, "Oil: Our Deepest Frontier." 46-09-01 Wisconsin State Journal - 2 p.m.--National Hour (WMAQ): "G.I. Joe College." (WIBA at 4 p.m.). 2 p.m.--National Hour (WMAQ): "Fit to Print," story of 50 years of news reporting by New York Times; speaker, Herbert Matthews, chief of Times London bureau, speaking from London. 2 p.m.--Carmen Cavallaro (WMAQ): "The Night Is Young," "Who's Sorroy Now," "Begin the Beguine," "Surrender."